March 25, 2017, 3:56 p.m.
Our first STEM project turned out to be the biggest, in scale, that the team has worked on. 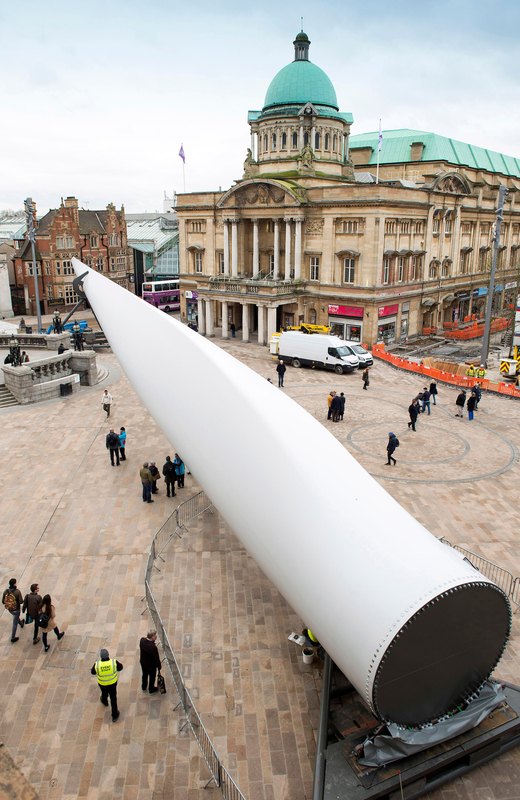 An opportunity to share a digital storytelling piece about a 75 metre, 25 tonnes and 3.5 metre diameter wind turbine blade, which made a surprise entrance in January when it arrived as an art installation called Blade. As Blade left Queen Victoria Square last Sunday, to return to the Siemens plant at Alexandra Dock, it carried with it a couple of projects from Connected Hull. And ones that have digitised this City of Culture project through the Things Network in Hull. In essence that was a sensor node and a Raspberry Pi with a camera module attached, but in reality a whole lot more. We're grateful to the team at Siemens in Hull, who offered STEM learning opportunities through Blade and a chance for the Hull Raspberry Jam community to collaborate on their 'super secret project' with Hull Central Library. A huge team effort at the Raspberry Jam, on Saturday 18th February, resulted in this timelapse showing 2,383 images taken on the journey back to Alexandra Dock. The sensor node collected temperature, vibration and GPS data and sent it to The Things Network via a gateway in Hull city centre. That data is now shared on this site and further projects will follow on a similar data theme. Next will be a 'STEM in the Desert' project and more innovations with temperature and environmental data.